Wanting to kill our hangovers Sunday morning we decided to take on some waves even though the lifeguards warned against it. They told us once as we tried to swim straight into a rip tide and sent us up the beach to a safer area but still out we swam in the strong current. More quickly than I realized the tide had taken me far far from the beach and the next thing I knew I was swallowing water, ducking and diving under huge waves coming at me in every direction. 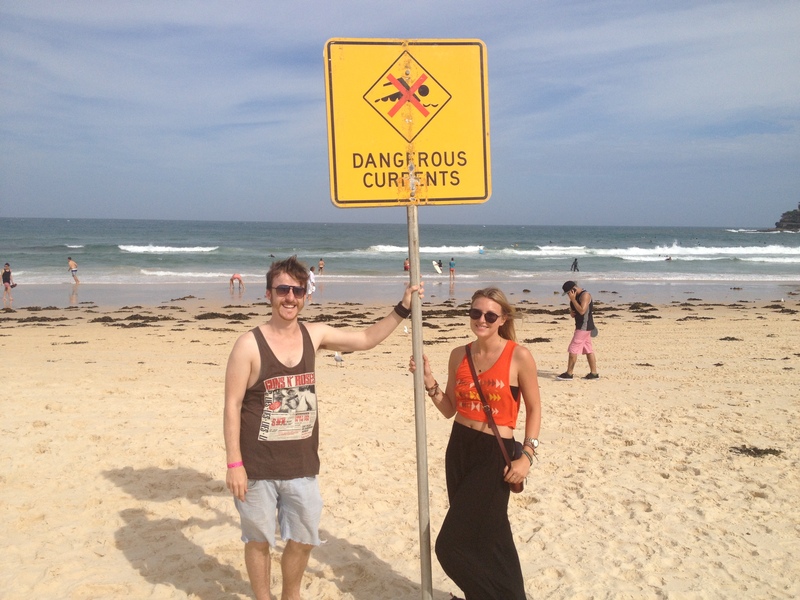 Although at the time I wasn’t too panicked, I did not have the strength to take on these waves. In the distance my tall friend Adam came to my rescue when he saw me getting pummeled wave after wave and he helped drag me on to shore. While nearing the beach I realized what a commotion I’d caused. All the lifeguards were down by me in the water apparently yelling in megaphone to me ready to save the idiot foreigner. As I walked up to the lifeguards I was told I was lucky, one more minute and the tide would have taken me out and nobody could have saved me. Welp, sorry Ma you probably don’t like to hear that story but just a fair warning when the beach is closed due to dangerous currents listen to the experts. 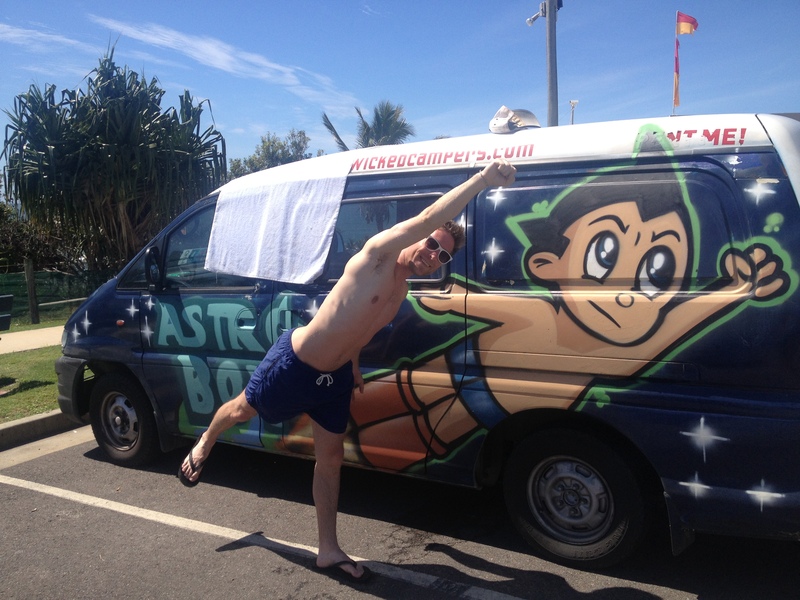 Astrovan down the East Coast – I was lucky enough to have one of my best friends from back home meet me for a holiday down the coast. Heaps of backpackers hire vans and drive along the ocean visiting beautiful beaches, rain forests, and partaking in all types of extreme sports. Jon and I decided to skydive to start our 2 week vacation. Slightly hungover from a good ole St. Patty’s Day celebration we were hauled off 2 hours south of Cairns to make our jumps. 5 of us including the pilot piled on to a teeny plane at set off to climb 14,000ft. The view was stunning with the Great Barrier Reef in the distance and hundreds of lively green islands spread across the coast. I was waiting for nerves to kick in but it wasn’t till Dan (my man strapped to my back) had me dangling out the plane door when my brain was thinking this isn’t normal. Next thing I know we’re out the door and falling fast. He spun us around as I screamed out of excitement. 60seconds flew and instantly it goes from holy effen insanity to the most peaceful glide of my life. He let me control the chute as he pointed out sea turtles, manta rays, and even a little shark in the water below. We landed easily on the beach and watched Jon finish his jump. Unfortunately the ride down made him a little green but regardless we both loved every second of it. Our next adventure took us North to the resort-like town of Port Douglas for some Great Barrier Reef snorkeling. We chartered out far off the coast to 3 different reef sights. The colors and types of fish and coral was mesmerizing. Swimming around these little cities of sea life was truly incredible. Our second spot was full of every size of jellyfish. I mean thousands every way you turned, I’m thankful for the full body wetsuits even though I still received a few small stings on the face. A group of marine biologists were on our boat so we followed them around as they pointed out awesome finds in the reef. 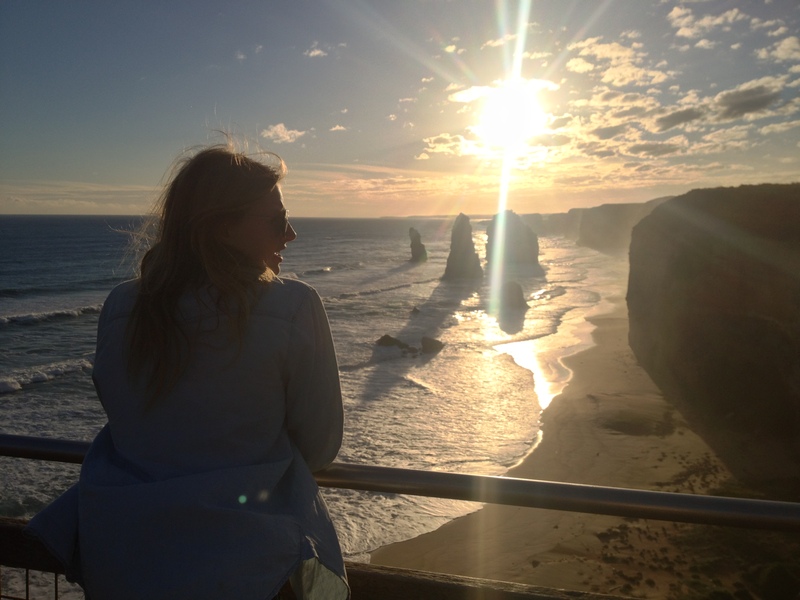 Another beautiful, adventurous day in Oz for Jon and I.
Getaway to Phillip Island – had my first and so only surf lesson on one of my first weeks of arriving in Melbourne. My friend Tim drove us down to Phillip Island to hit up stunning Smith Beach. My first few attempts weren’t great but once I traded in Tim’s small board for a foam floating banana board I was able to catch a few waves on my own. I’m mad I have yet to get back on a board but Melbourne’s lack of surf plus not having a car makes it near impossible. The surfing culture is amazing in this country and to hear how peaceful and what a stress reliever it is, I hope I get the chance to live near waves soon to get as good as the Aussies. 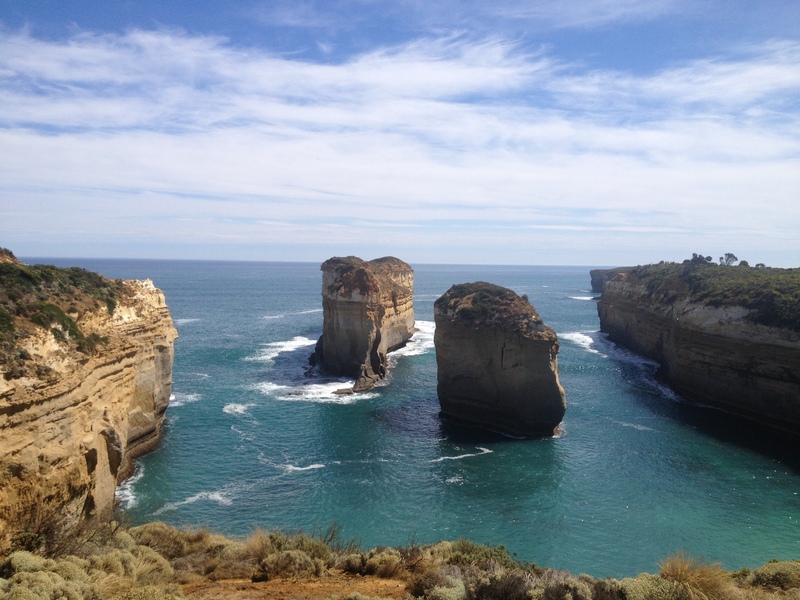 Great Ocean Road trips – twice now I have journeyed along the breathtaking southern coast of Oz and both times were just as beautiful. 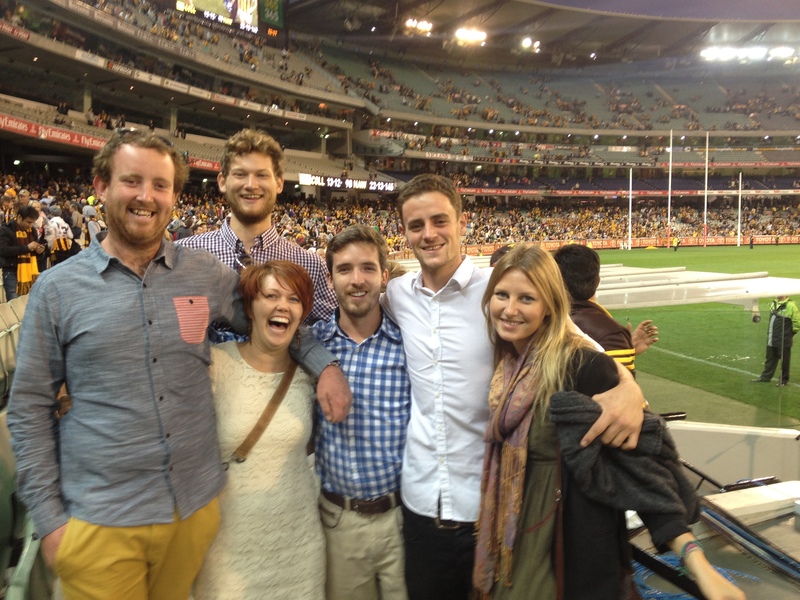 The first before my English mate Vanessa left Melbs and the second before my English mate Ryan left for the east coast (I surround myself with the English apparently it’s a German thing). Along the coast you’ll experience incredible rock formations standing in a collaboration of the prettiest blues you’ve ever seen and find Oz’s famous animals hanging out. We saw heaps of koalas, roos waiting to cross roads, extra loud tropical birds, and even a dingo sprinting in front of the car. I drove the entire second trip and I must say I’m pretty good at roundabouts and driving on the left side now. It’ll be odd to be back on the right when I return home. My favorite spot on the trip is Lorne. A quiet, little beach town with one main stretch of shops sitting across from the water. Ry and I got to camp next the beach, drank under an amazing display of stars, and fell asleep to the waves. We also stopped at Bells Beach where the famous RipCurl Pro Surf competition is held each year and where the setting “takes place” in the movie Point Break. Two more gorgeous adventures to add to my trip. I could tell a million more stories but I should stop there. As I close the door to my life in Oz, I am grateful for the friends I’ve made, the trips I took, and the government for their amazingly high wages and holiday pay. With that said I’m gonna take all that Australian dolla, fit my life on my back, and go onward with my travels.